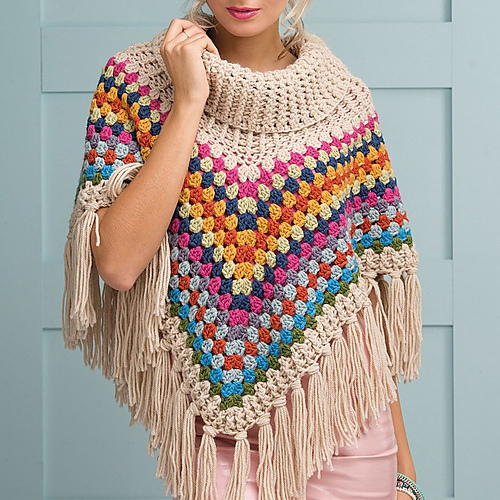 I found this other cowl neck poncho pattern worked in granny trebles in the Simple Crochet magazine [issue 25]. Ashley did re-created in different colors but I still prefer the original palette. The fringes might be a bit tedious to do … so many of them! This ‘British’ pattern can be purchased online at Ravelry for 2.75 GBP [about $4]. And perhaps, you don’t have to purchase it after all [darn] if you can find your way with Attic 24’s creation where Lucy avoided the frindge-crazyness by finishing it with ‘two rounds of double crochet followed by two rounds of chain loops, then a final round to create the pointy waves on the egde-of-the-edge‘. She used a 6.5mm for the cowl and a 6mm hook for the body and edging. Mwah-haha! This is going to be fun to make and lovely to wear!